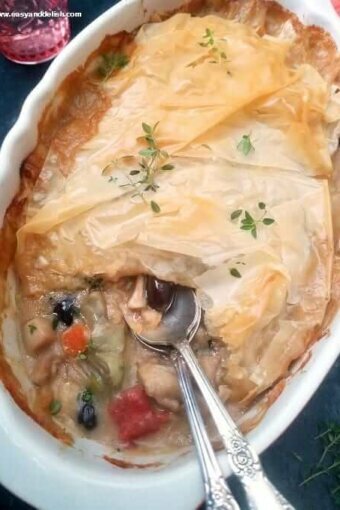 An easy Mediterranean Chicken Pot Pie made with phyllo dough. It has all the comforting flavors of the classic dish, yet is lighter, with a Mediterranean touch! In a large stainless steel saucepan, heat oil over medium heat. Cook onion, carrot and celery for about 3 minutes, stirring occasionally. Do not let brown! Stir in canned diced tomatoes, chicken, and wine. Cover pan and let cook for about 5 minutes, stirring every once in a while. Transfer to a bowl and set aside. In the same pan, melt butter over medium heat. Whisk in flour, salt and pepper until well blended. Gradually whisk in warm broth and milk, cooking and stirring until bubbly and thickened. Stir in chicken mixture and mix olives, capers, and artichokes. Remove from heat and spoon chicken mixture into a medium baking dish . Unroll phyllo dough and layer 7 sheets of phyllo on top of filling, brushing each with olive oil and crumpling sheets gently. Bake for 20-25 minutes or until crust is golden and crispy and filling is bubbly. Let stand for 5 minutes before serving with a sprinkle of fresh thyme on top. Enjoy! Mediterranean chicken pot pie leftovers should be covered and can be refrigerated for up to 2-3 days. Curious to find out where chicken pot pie comes from? Not America! Pot pie most likely originated in Greece, where cooked meats were mixed with other ingredients in an open pastry shell ("Artocreas"). The Romans then took this recipe and added a top pastry crust, making it a fully enclosed meat pie. Only in the 19th Century did Americans come to know pot pies, which were brought by settlers. But in the last and present centuries, the pies and their different meat variations have become super popular in the United States. Love chicken pot pies and its various forms? Try our Brazilian chicken pot pie.